Num­ber of bait­fish raised in the U.S.
Bait­fish are small fish that are sold to recre­ational fish­er­men, who usu­ally im­pale them on a hook and use them as live bait for big­ger fish. In this ar­ti­cle, I dis­cuss why I think that lob­by­ing for stric­ter bait­fish reg­u­la­tions in the U.S. can be an effec­tive in­ter­ven­tion. 1 to 10 billion farmed bait­fish are sold in the U.S. an­nu­ally. For com­par­i­son, U.S. meat con­sump­tion is re­spon­si­ble for the slaugh­ter­ing of 1.3 to 2.5 billion farmed fish and ~7.7 billion land ver­te­brates an­nu­ally. Farmed bait­fish suffer not only dur­ing farm­ing, but also when trans­ported and kept by whole­salers, re­tailers, and fish­er­men, where con­di­tions may be worse. They also suffer dur­ing an­gling. Most farmed bait­fish are sold when they are about 1 year old. I was able to find very lit­tle ev­i­dence of an­i­mal ac­tivism di­rected to­wards stric­ter bait­fish laws. The is­sue seems to be very ne­glected. Live bait­fish use is pro­hibited in some parts of Europe, Canada and the U.S. due to con­cerns about in­va­sive species, spread of dis­eases, and an­i­mal rights. This is an in­di­ca­tion that lob­by­ing for stric­ter reg­u­la­tions could be tractable. If the use of live bait­fish was pro­hibited, some an­glers would likely use ar­tifi­cial baits in­stead, but some would choose to use worms, leeches, or other an­i­mals as live bait. Ac­cord­ing to the USDA’s Cen­sus of Aqua­cul­ture, over 1.17 billion bait­fish were sold in the U.S. in 2013. One Arkansas farm boasts of hatch­ing (or “be ca­pa­ble of pro­duc­ing”) 1 billion golden shriners an­nu­ally. This seems to con­tra­dict the Cen­sus of Aqua­cul­ture, which claims that 523 mil­lion golden shin­ers were pro­duced in the whole U.S. in 2013. Stone et al. (1997) claim that Arkansas alone is pro­duc­ing over six billion bait­fish an­nu­ally. Good­win et al. (2004) claim that “More than 80% of all bait­fish are farm raised, but there is a very sig­nifi­cant trade in wild-caught fish (Stone et al. 1997). The bait­fish in­dus­try ships more than 10 billion fish per year.” Since it’s cit­ing the ar­ti­cle in the point above, I’m guess­ing that the 10 billion figure is just an ex­trap­o­la­tion of the 6 billion figure for the whole U.S. I haven’t found any ar­ti­cles cit­ing The Cen­sus of Aqua­cul­ture figure which makes me doubt its ac­cu­racy. The six billion figure for Arkansas from Stone et al. 1997 is widely cited. How­ever, it could be out­dated, es­pe­cially since the in­dus­try seems to be on the de­cline. Gun­der­son and Tucker (2000) also claim that there are dis­crep­an­cies be­tween the 1998 Cen­sus of Aqua­cul­ture and other sur­veys be­cause the cen­sus did not define aqua­cul­ture prod­ucts. Later cen­suses defined aqua­cul­ture prod­ucts more clearly but their defi­ni­tion might have differed from defi­ni­tions in other sur­veys. Mor­tal­ity in farms. Mischke (2012), p. 223 sug­gests that bait­fish may have a mor­tal­ity rate of ~25% (“from fry to ju­ve­nile”). When it comes to the num­ber of in­di­vi­d­u­als, the bait­fish in­dus­try is com­pa­rable to the food­fish in­dus­try. U.S. food con­sump­tion is re­spon­si­ble for farm­ing of 3.9–7.8 fish per year per cap­ita, ex­clud­ing shel­lfish. 1–10 billion bait­fish pro­duced an­nu­ally trans­lates to 3-31 bait­fish pro­duced per year per cap­ita. How­ever, food fish tend to be much big­ger and rais­ing them usu­ally takes slightly more time. Edit (Sept 15th, 2018): since the in­dus­try is on the de­cline, the num­ber is prob­a­bly closer to 1 billion than 10 billion. It also could have de­clined to be be­low 1 billion since the last es­ti­mates were made. If the bait­fish in­dus­try re­ally is on the de­cline, it de­creases the im­por­tance of the cause. How­ever, it may also in­crease tractabil­ity. The in­volve­ment of an­i­mal rights groups may be the fi­nal push that causes the in­dus­try to col­lapse or pre­vents it from re­cov­er­ing. It may also pre­vent im­ple­ment­ing plans to in­crease the scale of salt­wa­ter bait­fish aqua­cul­ture (cur­rently most of the farmed bait­fish are used for fresh­wa­ter fish­ing). Lit­vak and Man­drak (1993) con­ser­va­tively es­ti­mated the re­tail value of bait­fish sold in Canada and the United States (both farm-raised and wild-caught) to be $1 billion an­nu­ally. Ac­cord­ing to gov­ern­ment data, the to­tal value of farmed bait­fish sold in the U.S. was 63 mil­lion in 1993 and 29 mil­lion in 2013. As I un­der­stand, U.S. gov­ern­ment figures are lower than Lit­vak and Man­drak (1993) partly be­cause they are calcu­lat­ing the value of fish sold by farms rather than re­tail value, and they ex­clude Canada where wild-caught bait­fish is sold. Bait­fish are cheap per in­di­vi­d­ual, es­pe­cially at whole­sale price. $1 can pur­chase 9 to 63 fish, de­pend­ing on the species. Ven­tura et al. (2017) show that bait­fish are also farmed for recre­ational fish­ing in Brazil. Us­ing fish as live bait is already pro­hibited in some U.S. and Cana­dian states. Many other states have im­port and move­ment re­stric­tions. An overview can be seen in Kerr (2012). More de­tailed in­for­ma­tion about laws in each state can be found in this table. In Scot­land, it is pro­hibited to use any live ver­te­brate as bait. Some of the dis­cus­sion lead­ing to the pro­hi­bi­tion can be found here and here. Switzer­land seems to have a similar reg­u­la­tion. In Poland, Den­mark, and the rest of the UK, it is only al­lowed to use bait­fish that is caught in the same wa­ters it is used. As I un­der­stand, this prac­ti­cally elimi­nates the pos­si­bil­ity of a bait­fish farm­ing in­dus­try. This ar­ti­cle claims that the ban in Scot­land was a “mas­sive first step” in PETA’s fight for pro­hibit­ing live bait in the rest of Bri­tain. I haven’t been able to find what PETA did though. This page de­scribes an­other cam­paign in the UK. Based on my in­ves­ti­ga­tion, I think that an in­ter­ven­tion in this area could be effec­tive. I would like to know whether or not other peo­ple agree. I am also un­sure how to pro­ceed if we were to con­clude that it was a promis­ing op­por­tu­nity. Maybe with some lob­by­ing the out­comes of some bait­fish-re­lated policy dis­putes (like this one) could in­fluenced. How­ever, I don’t have re­sources or ex­per­tise to do any­thing about it my­self. I thought I could send this text to some U.S. an­i­mal char­i­ties and ask if they would be in­ter­ested in pur­su­ing the op­por­tu­nity. Sugges­tions about what to do would be wel­come. If some ac­tion were taken, I think we should be sen­si­tive to the fact that the bait­fish in­dus­try is the source of liveli­hood for many well-mean­ing peo­ple. The most pop­u­lar bait­fish are golden shin­ers and fat­head min­nows. Gun­der­son (2018) claims that most golden shin­ers are sold when they are 1 year old, some ear­lier, some when they are 1.5 years old (page 7). Based on fat­head min­now aqua­cul­ture de­scrip­tion in Gun­der­son and Tucker (2000), it seems that most fat­head min­nows are sold when they are about 1 year old as well (page 7). The ar­ti­cle cites PETA’s em­ployee Yvonne Tay­lor. If needed, maybe she could be con­tacted for more in­for­ma­tion. Ca­role R. En­gle, Kwa­mena K. 2008. Aqua­cul­ture Mar­ket­ing Hand­book. Gun­der­son, Jeffrey L. and Tucker, Paul. 2000. A White Paper on the sta­tus and needs of bait­fish aqua­cul­ture in the North Cen­tral Re­gion. Hilts, Bill. 2018. Shop’s clo­sure af­ter 42 years leaves a bait­fish void. Kerr, Steven J. 2012. Bait man­age­ment re­view. the United States. Fish­eries 18(12):6–13. Stone, Nathan. 2003. Re­cent Devel­op­ments in Bait­fish Pro­duc­tion Tech­niques. Stone, N., E. Park, L. Dor­man and H. Thom­forde. 1997. Bait­fish cul­ture in Arkansas. World Aqua. 28(4):5-13. Ven­tura, A., Pá­dua, S., Ishikawa, M., Mart­ins, M., Take­moto, R., Jerôn­imo, G. (2018). En­dopar­a­sites of Gym­no­tus sp. (Gym­no­tiformes: Gym­noti­dae) from com­mer­cial bait­fish farm­ing in Pan­tanal basin, Cen­tral Brazil. Bo­le­tim do In­sti­tuto de Pesca Sao Paulo. I warmly thank Kieran Grieg for pro­vid­ing sug­ges­tions and com­ments on this post and An­nie Alexan­der-Barnes for copy-edit­ing. Thanks for look­ing into this Saulius! I’d seen a few things re bait­fish and it has been on my list to look more into for a while. But this will raise its pri­or­ity—and make my task eas­ier by pro­vid­ing a lot of the un­der­ly­ing sources. I’ll dis­cuss this with some of the farm an­i­mal groups to see if they have ideas. In the mean­time, let me know if you find more info. If there is some kind of info that you need, let me know. I’d be ea­ger to help and I may know where to find it (be­cause I spent some time read­ing about the sub­ject). I agree. I’ll aim to put to­gether a list of re­search Q’s I’m in­ter­ested in and share within the next month. Gen­er­ally posts of this form—pro­vid­ing data and in­for­ma­tion on a ne­glected is­sue—are the most valuable, though I try to read most EA posts re an­i­mal welfare ideas. Amaz­ing idea! I’ll be think­ing and talk­ing more about this, in­clud­ing with the an­i­mal-is­sue lob­by­ing or­ga­ni­za­tions I’ve worked with here in the US and Cal­ifor­nia. great, please tell how it goes! Thanks. I en­coun­tered the 6 billion figure by ac­ci­dent when do­ing re­search about fish farmed for food for ACE. I won­der if there are other ar­eas like this where a huge num­ber of an­i­mals are hurt that an­i­mal ac­tivists are un­aware of. I don’t have good an­swers to your ques­tions, but I’m go­ing to do a bit of a brain dump here and an­swer them to the best of my knowl­edge, in case some­one would find it valuable. what per­centage of bait fish will be re­placed by ar­tifi­cial baits vs an­i­mals? If you used worms or other an­i­mals as bait, would you have to use more bait, or would it be a 1-1 re­place­ment? Ar­tifi­cial baits seem to already be more pop­u­lar. E.g. see http://​​www.an­gler­sur­vey.com/​​files/​​2012/​​10/​​AS3-1.png (“live bait” here means live bait­fish, worms leeches, frogs, etc.). Although one text I read said that in­ter­net is bi­ased to­wards ar­tifi­cials baits be­cause they are used by peo­ple who take fish­ing more se­ri­ously (and there­fore talk about it on in­ter­net more). So the sur­vey might have a se­lec­tion bias as well. 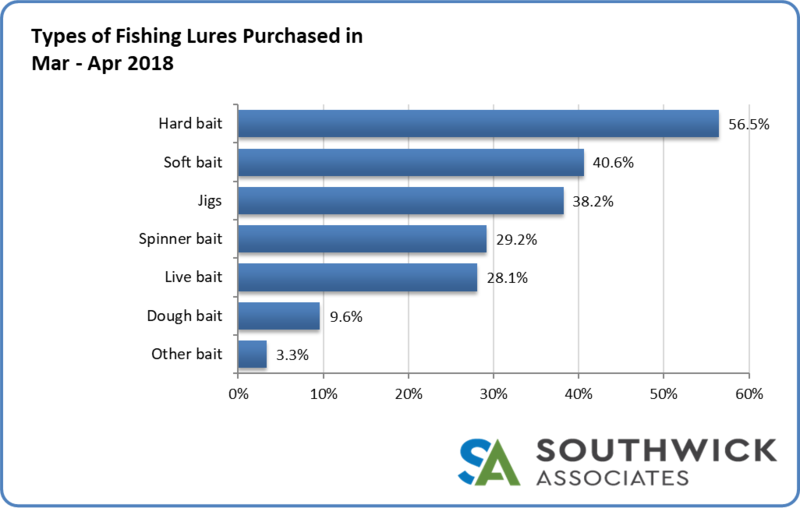 I have a hunch that peo­ple who use bait­fish would be more likely to switch to other types of life bait, rather than ar­tifi­cial bait. Also, if farm­ing of live bait was banned, some would catch live bat­fish for them­selves. That is prob­a­bly bet­ter than farm­ing though. Be­fore I read Peter Singer, I used to fish with my father. From ex­pe­rience, I can tell that if they switched to worms, many more worms and mag­gots would be used than bait­fish. E.g. see the amounts in https://​​www.worms­di­rec­tuk.co.uk/​​acat­a­log/​​den­drobaena.html. We would keep mag­gots in the fridge, some­times would hook sev­eral of them and would buy more than needed just to be safe. I might write a sep­a­rate ar­ti­cle about worms and mag­gots as bait some time later. I do think that they suffer less (both, be­cause they live shorter lives be­fore be­ing used, and they are less sen­tient). But it could be that they are very stressed in those con­tain­ers. So yes, it’s pos­si­ble that coun­ter­fac­tual is even worse. By the way, maybe some ques­tions like this can be an­swered by just go­ing to a nearby fish­ing or bait store and ask­ing some ques­tions. E.g. how many fish and how many worms do peo­ple usu­ally buy? I wish I could’ve done that while writ­ing this, but I don’t live in the U.S. Some of the links that I put in the ar­ti­cle partly an­swer this ques­tion, es­pe­cially for Scot­land. It seems that these laws are always con­tro­ver­sial, fish­er­men don’t want re­stric­tions and peo­ple who care about ecol­ogy want them. E.g. see this 90 page risk re­port about ecolog­i­cal risks of im­port­ing one species of bait­fish from Arkansas to Min­nesota- https://​​files.dnr.state.mn.us/​​aboutdnr/​​re­ports/​​leg­is­la­tive/​​2018-min­now-im­port-re­port.pdf The length tells me that it is an im­por­tant is­sue for some peo­ple. In North Amer­ica, a lot of rules were im­ple­mented af­ter an out­break of viral hem­or­rhagic sep­ticemia (VHS) in Great Lakes and some other wa­ters in 2005-06. Some de­tails about reg­u­la­tion changes can be seen at this web­site https://​​www.out­doornews.com/​​search/​​bait­fish+rule It seems that reg­u­la­tions are always done at state level and in­sti­tu­tions like “Ver­mont Fish & Wildlife Board” are re­spon­si­ble for them. Ugg.. some­thing smells fishy here.. : ) The num­bers seem com­pletely out­landish.. 1 − 10 billion for recre­ational fish­ing in the US? There are, what.. 300 − 500 mil­lion to­tal pop­u­la­tion in the US, I be­lieve? Even as­sum­ing 10% are into fish­ing, would they con­sume 1 billion bait fish? I’m ex­tremely skep­ti­cal of this and strongly in­clined to make a bet against this info be­ing ac­cu­rate. Cur­rently con­sid­er­ing what ex­actly I’d be will­ing to put money down against. My in­tu­ition is that these figures might be off by a fac­tor of ten or more. Pos­si­ble. It could be that the in­dus­try in­flates the num­bers be­cause they want to seem big­ger than they are. Note that bait­fish is not even the most pop­u­lar type of bait. Re­quest a dis­count when pur­chas­ing in bulk. In­jured min­nows may be sold at a dis­counted rate, but fish that are in­jured rarely thrive af­ter a change in en­vi­ron­ment. In­stead, re­quest a free dozen for ev­ery 10 dozen that you pur­chase. So I imag­ine that fish­er­men who do buy bait­fish, buy a lot of it. I also read that they of­ten don’t use them all and throw the rest into a lake, even though that causes ecolog­i­cal is­sues and ev­ery­one is ask­ing fish­er­men not to do it. In gen­eral, I un­der­stand your in­tu­ition and I will prob­a­bly think about this more later. in https://​​www.ice­shanty.com/​​ice_fish­ing/​​in­dex.php?topic=246812.0 an an­gler asks in a fo­rum how many min­nows should she buy for her fish­ing trip. The most com­mon an­swer is 2-3 dozens. I was won­der­ing if it’s a differ­ence be­tween num­ber hatched and num­ber that make it to the one-year mark at which they’re sold? I am similarly sus­pi­cious. Some­one should look into this more. I’m not sure how to look into this more. Note that the 1.17 billion figure is from the U.S. Gover­ment re­port so that should be de­pend­able, at least for the lower bound. I think some more in­for­ma­tion could be gained by go­ing to a bait­shop, look­ing around and ask­ing some ques­tions (how many fish av­er­age per­son buys, is the in­dus­try on the de­cline, etc.). I my­self can not do that be­cause I’m not in the U.S.
One could po­ten­tially sur­vey a rep­re­sen­ta­tive fish­er­per­son pop­u­la­tion? I’ve just no­ticed that my text looks weird on mo­bile phone. I wrote it in google docs and pasted to EA fo­rum. Is there any quick way to fix it? In case any­one has trou­ble read­ing it, you can also read it here. Thanks for post­ing this! I always love see­ing peo­ple post­ing po­ten­tial new ar­eas of ac­tion and this cer­tainly looks like it could be promis­ing.